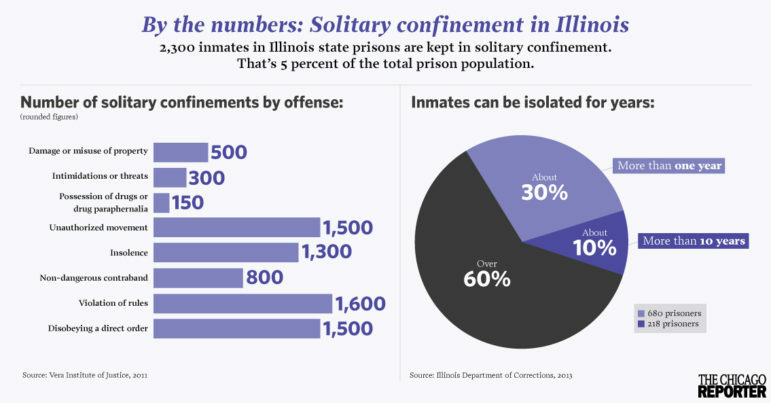 A class action lawsuit filed this week on behalf of former and current inmates is challenging the widespread use of solitary confinement by the Illinois Department of Corrections. A total of about 2,300 state prison inmates — including about 15 percent of those housed in maximum security facilities — are kept in solitary confinement, often for relatively minor offenses, said Alan Mills, executive director of Uptown People’s Law Center, which filed the legal challenge with the law firm Winston & Strawn. Solitary confinement is generally defined as 22 to 24 hours of isolation a day and can last years, he said. The United Nations considers isolation lasting 15 days or longer to be torture. “I don’t know anybody who spent more than a few months in solitary who doesn’t come out quite damaged,” Mills told the Reporter. The suit is aimed at getting the state corrections department to implement the American Bar Association’s standards on segregation, which limit how long individuals are held in solitary confinement and recommend that people living with mental illness not be subjected to the punishment. The Illinois Department of Corrections declined to comment on the lawsuit. Sarah Turbin is a multimedia intern with The Chicago Reporter.